Have your integrated fridge properly installed to achieve that neat and stylish look of your kitchen! How to replace your fridge freezer? You can have your new fridge freezer safely and securely installed by professionals. Just take advantage of our integrated fridge freezer installation service. This is a convenient and elegant solution when you wish to fit out your property with a new kitchen appliance. The handymen can install freestanding fridge freezers, integrated (with sliding door or fixed/door-on-door), semi-integrated and American-style models. 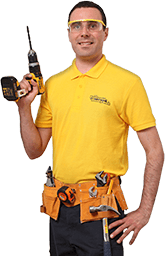 Before the integrated fridge installation service, please make sure that the handymen will have access to the area where you want the appliance to be installed. Also, proper electrical connection within 1.5 meters of the area is necessary. Whether you need professional maintenance or a complete fridge replacement, our refrigerator installation has you completely covered. 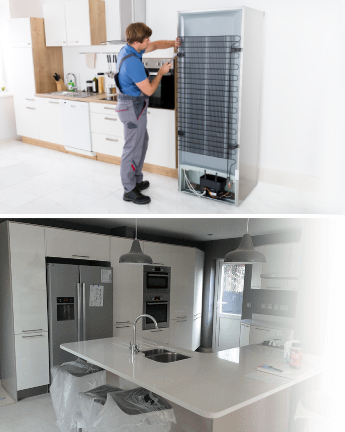 For example, the skilled specialists can safely remove your current fridge and connect its shiny new replacement to the water supply. If you suspect a leak, the diligent pros can also take a good look at the plumbing connections of your water or ice model and replace those if need be. Need some basic carpentry work instead? No worries – your handymen have the right tools and the know-how to drill holes or cut worktops to accommodate a bigger hob. And if you don’t know where to store your old appliance, simply book our efficient rubbish removal as well and let the professionals handle the rest. One of the best places for a fridge freezer is a kitchen unit space near a power socket. This way the appliance becomes easier to use and blends perfectly with the interior. The unit should never be situated near a heating device such as a cooker, radiator, water heater and so on. Also, it shouldn't be exposed to direct sunlight if possible – otherwise the appliance will have to compensate by expending more power. Another important thing to keep in mind is that the sides of the fridge freezer heat up while it is operational so proper ventilation is of importance as well.